SpaceX's fourth space station-bound Dragon uncrewed capsule is seen poised atop the company's Falcon 9 rocket at Launch Complex 40 at the Cape Canaveral Air Force Station in Florida, April 14, 2014. 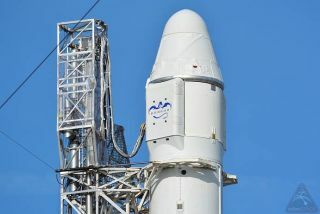 SpaceX called off the planned launch of a commercial cargo ship bound for the International Space Station for NASA Monday (April 14) due to a helium leak on the company's Falcon 9 rocket that will keep the mission stuck on Earth until at least Friday (April 18). The private spaceflight company's unmanned Dragon spacecraft was counting down toward a liftoff at 4:58 p.m. EDT (2058 GMT) from Florida's Cape Canaveral Air Force Station. But the attempt was scrubbed about an hour before launch due to the helium leak. Today's scrub follows two earlier delays that have already pushed the next Dragon launch by more than a month. SpaceX initially hoped to launch the mission on March 13, but the company delayed it by about two weeks to tie up a few loose ends. The launch was pushed back again, to mid-April, when a fire damaged a ground-based radar system used to track liftoffs from Cape Canaveral. The upcoming mission will be the third of 12 Dragon delivery missions to the space station by California-based SpaceX under a $1.6 billion contract with NASA. SpaceX launched its first cargo run to the station in 2012. Another company, Orbital Sciences Corp. of Dulles, Va., has a $1.9 billion contract for eight cargo missions — the first of which launched in January — using its own Antares rockets and Cygnus spacecraft. The weather forecast on Friday predicts only a 40 percent chance of good launch conditions, but SpaceX officials plan to complete helium leak repairs in time to make a second launch attempt this week. SpaceX's Dragon spacecraft is packed with nearly 5,000 lbs. (2,268 kilograms) of food, scientific experiments and other supplies for the space station. That cargo includes some intriguing items, including legs for NASA's humanoid robot Robonaut 2 and a miniature farm that should let astronauts grow lettuce in space. Dragon is also toting a NASA laser-communication experiment called OPALS (Optical Payload for Lasercomm Science). While cargo delivery is the primary aim of the mission, SpaceX also hopes to return the Falcon 9's first stage softly to Earth to help develop and demonstrate reusable-rocket technology, which company officials say could dramatically reduce the cost of spaceflight down the road. The first stage is even equipped with four 25-foot-long (7.6 meters) landing legs to help steady its descent toward the Pacific Ocean, where SpaceX hopes to retrieve it by boat. Company officials don't necessarily expect the reusability test to succeed but say they'll learn a lot from the experiment, whatever happens. "The entire recovery of the first stage is entirely experimental," SpaceX vice president of mission assurance Hans Koenigsmann told reporters Sunday (April 13). "It has nothing to do with the primary mission here."